JB comes to grips with an example of the very first M5. The engine catches quickly after keying the ignition and settles into a busy thrum. This 24-valve, 3.5-litre M88 motor, originally designed for the M1, is undeniably exotic with its individual butterfly throttles and custom pistons and rods, while its Bosch Motronic fuel injection helped deliver the standing quarter in 14.6s. 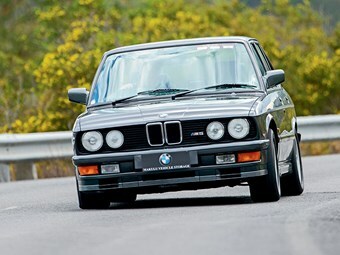 There were actually two engines available for the M5. The M88 is the hi-po lump, identifiable by the ‘M Power’ valve cover, while the catalysed S38 donk is shy of a handful of ponies and has the legend ‘BMW M Power’ visible when you pop the bonnet. I was expecting the M5 to be a bit of a ball-tearer given its ‘widowmaker’ reputation but that’s a long way from the truth. Pedal it along with a bit of verve and you’re instantly impressed with the sheer linearity of the engine’s response, helped by a very long travel but instantly responsive throttle pedal. Unlike the 333i, this South African-built M5, built in the Rosslyn plant just outside Pretoria, is always travelling faster than you give it credit for. The engine sounds fantastic. Not lairy, just wonderfully gravelly and with a nice refinement at cruising speeds. It’s only when you approach the redline that it really gets a bit testy.